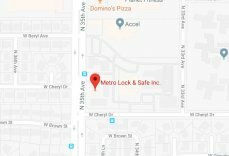 Dont Forget... | Metro Lock & Safe Inc.
Posted on December 17th, 2012 by Metro Lock & Safe Inc.
Every year, millions of Americans find themselves locked out of their car. Nothing is more frustrating than pulling on the door handle and feeling that it’s locked, and seeing your keys sitting on the seat. When this happens, it doesn’t just cost you money, but it costs you time as well. Newer cars have developed technologies that protect against theft, but may also leave you stranded when you lock your keys in your car. But you can develop certain habits that will help you to avoid this unfortunate and frustrating situation. You probably have several habits you perform each time you get in and out of your car. You most likely put on your seat belt, you may choose a certain CD, or you may plug in your phone. Getting in the habit of making sure you have your keys when you leave your car is simply a matter of associating that thought with something that is already a habit. For example, each time you grab your phone, make sure you have your keys in hand also. Doing simple things like this can guarantee that you never lock your keys in your car. When you run around to your trunk to get something out, don’t set your keys down in the trunk. Don’t set them down on a seat or in a cup holder either. Make sure they are constantly somewhere that you will notice them as you get in and out of the car. You may think you’ll remember them when you go to close the trunk, but few people do. Just avoid the situation where you have the chance of losing them. Keep a spare key on your body at all times. Slip one in a pocket in your purse or wallet or in the pocket of your pants. This way, if you do end up locking your keys in your car, you’ve always got a back up plan to help save you time and money. When you put your keys in a pocket, put them in a pocket that you can’t take off. For example, it is easy to slip off a sweatshirt or jacket and put it in the car or the trunk when it gets too warm. If the keys are in one of these pockets, you are out of luck. Keep your keys in your shirt pocket or your pants pocket as often as possible. There are times when every person is going to do something forgetful and lock his or her keys in the car. But you can decrease the chances of this happening to you often by developing habits that allow you to always be able to access your car.